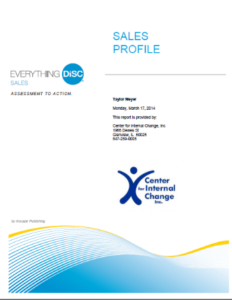 Everything DiSC Sales® is a beneficial tool for anyone who is in a sales role (which could be everyone)! With global and online competition, it’s imperative for the sales force to have tools to help them sell the unique benefits to customers, potential customers, and build loyalty to stay with you and your organization. With conscious work and coaching, the participant learns how to be effective using Everything DiSC® Sales and their other tools for improved results.